This is the first game in the Famicom Wars series. For other games in the series see the Famicom Wars category. Famicom Wars (ファミコンウォーズ, Famikon Wōzu?) is a turn-based strategy military game. Produced by Nintendo, it was released on August 12, 1988 for the Famicom in Japan and later re-released on the Wii Virtual Console on May 19, 2009. Development of Famicom Wars began as Intelligent Systems changed its direction from creating hardware to developing simulation games. It is the first game in the Wars series. Although the game was never released outside of Japan, a fan-made translation patch has been developed for the game, and can be found here. Players take control of one of two warring nations, Red Star and Blue Moon, as they seek to establish turn-based dominance over each other. After selecting which stage to start the game and setting which, if either, player will be controlled by a person, the Red Star army is given the first turn. The objective in each stage is to either conquer the enemy's headquarters or destroy all remaining enemy units in one turn. During each turn, the player is given a certain amount of funds which can be used to build units in factories, seaports, and airports in their command, as well as cities near their headquarters. Each unit has their own specialty and abilities, with ten land units (including two foot soldier units), four air units, and two sea units. Some units use firepower against the enemy, while others provide support to allies. Only foot soldier units are capable of conquering cities, which are used to repair or refuel damaged units and gain more funds. There are 15 maps available at the start of the game, with two secret ending maps dependent on if the player's nation when playing against the computer. 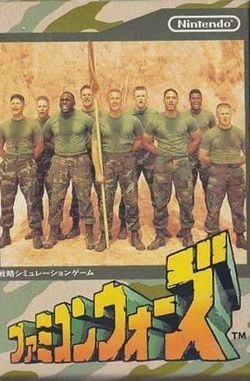 The original Famicom Wars was followed by a series of sequels which were released only in Japan as well, which includes Game Boy Wars in 1990 and Super Famicom Wars in 1998, both which were developed by Intelligent Systems, as opposed to a sub-series of sequels to the original Game Boy Wars, which were developed and published by Hudson Soft. The series eventually made its international debut with Advance Wars, released for the Game Boy Advance in 2001. The maps from both, Famicom Wars and Super Famicom Wars were later included in Advance Wars and its sequels. This page was last edited on 21 February 2018, at 18:17.